I am an owner of a handset with Reliance connection. About 1 month back I subscribed to a Cricket day SMS pack which is worth Rs. 5/- per match day i.e. whenever the match is telecast on TV on that day Rs. 5 will be deducted from my prepaid balance. Now comes the most pathetic thing about Reliance Mobile. According to the Reliance Customer Care and Reliance Web World, currently I do not have any pack activated (as visible in their records). But then also whenever match is telecast I get the score update SMS and Rs. 5 is deducted. Now I live on a zero rupee balance because whenever I try to recharge balance becomes 0. Since 1 month I have registered 5 complaints but still there is no solution to the problem but a fake assurance. I think that this problem is purely a technical problem (problem with database server) and the technical team of Reliance which deals with these problems is highly unskillful. So I request every Reliance Mobile User not to subscribe to any scheme of Reliance as u can also go through the same problem like I did. Sanchit, dealing problems with operator is a real pain in the a**. Even I have gone through this but maybe contacting a higher authority would help. 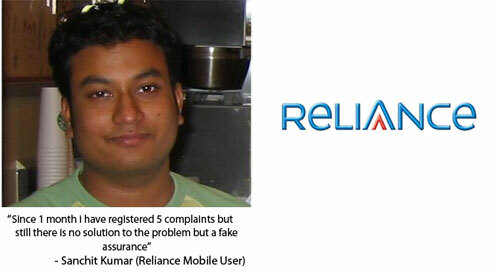 Just like this guy did to solve his Vodafone woes. Sanchit,Good that you raised your voice against these Non-Technical Support people who don’t know any thing about their system.I think you are right there is something wrong with the database system/Middleware system. I know it is painful when you describe this problem, 100 times to 100 support guys.I would say,call thier supervisor every time time you call and ask supervisor to connect you with reliance Technical database team or application team (if he cannot help you) + ask for the money back. Reliance is big thief. I always hate it and its CEO anil.These people are kickable at their well built a@@. I have used reliance money and it has been preety decent for me.